Today at lunch SLP and I were discussing digital literacy and I was reminded of this tweet. On reflection, I’d amend it slightly. Being a computer expert isn’t 90% not being afraid of the unknown, as much as it’s 90% not being afraid of screwing up. Everybody screws up. The only way you can avoid screwing up is by not doing anything in the first place. (Which is, I think, a kind of failure itself.) So, are you going to face that inevitability with confidence, or are you going to deny it by not even trying? This doesn’t just apply to computers. It applies to everything. Computers (and other technological gadgets) are just perhaps the most obvious place in modern life where the fear of failure clearly manifests. There’s something related to this fear and avoidance of failure: a lack of mindfulness. Again, not something specific to computers. When we are fearful, we can get absorbed in that fear, and forget to pay attention to what’s happening around us. Ironically, it is precisely that fear, leading to a lack of mindfulness, that can often be what leads to failure. By fearing failure, we make failure more likely. On the other hand, by facing the potential for failure with confidence, knowing that failure isn’t doom, we can clear distraction from our minds, remove the clouds of confusion, and see what is before us, which is the most important key to accurately assessing a problem and finding a solution. More specifically, when confronted with an unfamiliar technological interface, it’s easy to get overwhelmed, and to panic, and to either screw up or give up. But technology is nothing to fear. It’s merely a tool. Approach it with confidence, take your time, try things. Don’t be afraid to “break it.” If something could be broken so easily, it’s probably not worth bothering with anyway. It takes a lot to “break” a computer, generally involving a sledgehammer or being dropped from a 5th-story window, not a few errant mouse clicks. There’s another benefit to mindfulness and confidence: it makes seeking help easier. I’ve worked tech support, and in that job there’s nothing more frustrating than having a user tell you something “doesn’t work,” with no further elucidation. At worst, it leads to the assumption that the user isn’t trying (or is stupid), and even at best it’s unproductive. But when you’re confident enough not to become overwhelmed, and mindful enough to pay attention to the details of what you’re doing, you can provide a much more thorough explanation of the problem to the person who’s trying to help you. So, don’t be afraid. Your computer can’t hurt you. More importantly, you can’t hurt it. Take your time and, if necessary, a deep breath. Observe. Think. And if you screw up, try something else. It won’t hurt. Even if you’re not familiar with the contrived acronym CAPTCHA, you’ve probably encountered the concept from time to time online. It’s a reasonably reliable way for websites that allow user comments to distinguish a human from a spambot, and thus it’s one form of Turing test. So far so good. In fact I use one such CAPTCHA service, reCAPTCHA, for comments on this site. Tonight I was going over various pages of my site, attempting to apply yet another layer of polish to everything, and I discovered the most bizarre abomination of a CAPTCHA I have ever seen. I grabbed a screenshot, and here it is. Good luck with that. 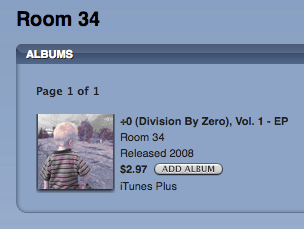 I was delighted — no, overjoyed — when I checked the iTunes Store today and discovered that my EP is available. But my enthusiasm was quickly tempered when I noticed that, curiously, all 3 songs appeared to have a running time of 45 seconds. Curious, considering that the tracks are 4:36, 1:38 and 2:36, respectively. I decided to spend the $2.97 to see what a customer would actually receive, and sure enough, each track cut off right at the 45-second mark. So I contacted TuneCore tech support, with a fairly mild (for me) email explaining the situation and requesting assistance. I received a response a few hours later informing me that the files they had on their server were corrupted. I will be emailing this rep new versions of the files shortly, and hopefully within a few days the correct full versions of the songs will be available. Maybe I should try the same approach to get them to replace Magma’s truncated K.A. 3!